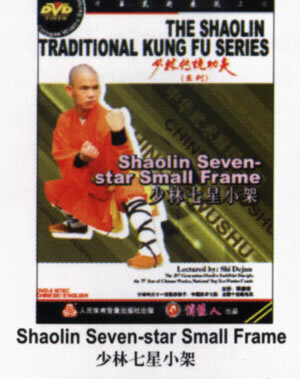 Seven-star small frame is one of the ancient boxing skills, especially the representative routine of Shaolin Quan. This routine is brief, flexible and changeful, with strict structure, smart frame, crisp and quick force exerting and pressing vigor, thus it can overwhelm the enemies quickly. This routine, as a difficultly accessed excellent routine, embodies the style of Shaolin Boxing, i.e. "defend as cat, act as tiger" and "fist striking the place where the cattle lies".